Rigdzin Düpa (Tib. རིག་འཛིན་འདུས་པ་, Wyl. rig 'dzin 'dus pa), 'The Gathering of Vidyadharas,' is the inner lama practice from the Longchen Nyingtik, the terma revelation of Jikmé Lingpa. They are all surrounded by all the vidyadharas of India and Tibet and the twenty-five disciples and yidam deities, dakas, dakinis and dharma protectors. The Gathering of Vidyādharas, the Inner Sādhana from the Heart Essence of the Vast Expanse, (ཀློང་ཆེན་སྙིང་གི་ཐིག་ལེ་ལས་ནང་སྒྲུབ་རིག་འཛིན་འདུས་པ།,klong chen snying gi thig le las nang sgrub rig ‘dzin ‘dus pa), revealed by Jikme Lingpa. English translation: The Assemblage of Vidyadharas of Long-Chen Nying-Thig, translated by Tulku Thondup (Gangtok, 1980, revised 1991). Dazzling Key Points: The Vidhādharas' Manual of Concealed Instructions, from the Heart Essence of the Vast Expanse (gab byang - klong chen snying gi thig le las/ gab byang gnad kyi mig tshag), revealed by Jikme Lingpa. English translation: Gabjang—the Inner Mantra Practice: Dazzling Key Points—The Vidhyādhara's Manual of Concealed Instructions, Rigpa Translations. The Garland of Offerings of the Sixteen Vajra Goddesses: The Lute of the Gandharvas (mchod phreng - rdo rje'i lha mo bcu drug gi mchod phreng dri za'i rgyud mang), revealed by Jikme Lingpa. 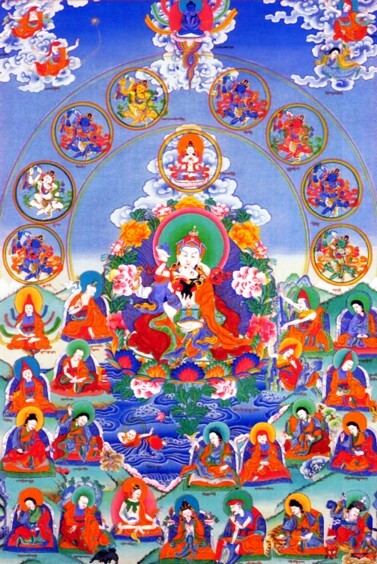 English translation: The Garland of Offerings of the Sixteen Vajra Goddesses— The Lute of the Gandharvas, Rigpa Translations. English translation (partly): “The Vase of Immortal Life”——Tsédrup: the Long Life Practice of the Vidyādharas, Rigpa Translations. English translation: Prayer to the Eight Supreme Vidyādharas of India, “A Constant Stream of Blessings” , Rigpa Translations. Rain of Siddhis: A Prayer to the Lineage of the Awareness Holder Assembly (rig 'dzin 'dus pa'i brgyud 'debs dngos grub char 'bebs), by the third Dodrupchen Jikme Tenpe Nyima. English translation: Rain of Siddhis: A Prayer to the Lineage of Rigdzin Düpa, translated by Adam Pearcey, Rigpa Translations. The Vajra Sound Goddes' Offering Clouds: The Abbreviated Garland of Offerings of the Sixteen Vajra Goddesses (mchod phreng mdor bsdus - rdo rje lha mo bcu drug gi mchod phreng mdor bsdud rdo rje sgra ma'i mchod sprin), by Jamyang Khyentsé Wangpo. English translation: The Abbreviated Garland of Offerings, Rigpa Translations. The Vajra Lute—A Brief Fulfilment for the Guru Practice Assembly of Awareness Holders (bskang sdus - klong chen snying gi thig le las bla ma rig 'dzin 'dus pa'i skong bsdus rdo rje'i rgyud mangs), by Jamyang Khyentse Wangpo. English translation: The Vajra Lute—A Brief Fulfilment for the Lama Rigdzin Düpa, Rigpa translations. Vajra Blessings: A Self-initiation for the Guru Practice Assembly of the Awareness Holders, from the Heart Essence of the Vast Expanse (bdag 'jug - klong chen snying gi thig le las/ bla ma rig 'dzin 'dus pa'i bdag 'jug rdo rje'i byin 'bebs), by Dilgo Khyentse Rinpoche. A Lake of Enjoyment [Fulfilling] All Wishes Related to the Two Accomplishments: A Framework for an Elaborate Accomplishment Practice of the Three Roots, of the Heart Essence of the Vast Expanse (sgrub khog - klong chen snying gi thig le'i rtsa ba gsum gyi spros bcas sgrub mchod rgyas pa'i khog phub grub gnyis 'dod dgu'i rol mtsho), by Dilgo Khyentse Rinpoche. The Wish-fulfilling King of Power Who Spontaneously Accomplishes the Two Aims: A Method for Bestowing the Long-life Empowerment for 'The Long Life Practice of the Awareness Holders: The Vase of Immortal Life' (rig 'dzin tshe dbang - rig 'dzin tshe sgrub bdud rtsi bum bcud kyi tshe dbang bskur thabs don gnyis lhun grub yid bzhin dbang gi rgyal po), by Dodrupchen Jikme Trinle Özer. The King’s Coronation Kamandalu Vase Root Empowerment, the Inner Enabling Empowerment, from the Heart Essence of the Vast Expanse (rtsa dbang - klong chen snying gi thig le las/ rtsa dbang rgyal thabs spyi blugs/ nang nus pa 'jug pa'i dbang ngo'), revealed by Jikme Lingpa. A Necklace of Lotus Flowers: An [Empowerment manual] which is Easy to Perform, Connected with the King’s Coronation Kamandalu Vase Root Empowerment, from the Heart Essence of the Vast Expanse (rtsa dbang - klong chen snying gi thig le las/ rig 'dzin 'dus pa'i rtsa dbang rgyal thabs spyi blugs kyi mtshams sbyor khyer bdes brgyan pa pad+ma'i do shal), by Chimé Tennyi Yungdrung Lingpa Jamgön Kongtrul Lodrö Tayé. A Garland of Ruby: The Empowerment for the Deities of the Assembly of Awareness Holders of the Heart Essence of the Vast Expanse (lha dbang - klong snying rig 'dzin 'dus pa'i lha dbang pad+ma rA ga'i phreng ba), by Dodrupchen Jikme Trinle Özer. Deathless Amṛta's Innermost Heart: Instructions For Times Such as When Accumulating The Long-life Empowerment of the Assembly of Awareness Holders (snying thig tshe dbang grangs gsog - rig 'dzin tshe dbang grangs gsog sogs kyi tshe nye bar bsdud pa 'chi med bdud rtsi'i yang snying), by Abhaya. English translation: The Casket of Siddhis, A Recitation Manual for Rigdzin Düpa, the Gathering of Vidyadharas Translated by Adam Pearcey for Rigpa Translations, 2006. Amended and first published on Lotsawa House, 2015. Crucial Points on the Visualisation of 'The Long Life Practice (Tsedrup) of the Vidyādharas' (tshe sgrub dmigs gnad - rig 'dzin tshe sgrub dmigs gnad gal mdo), by Jikme Lingpa. Vase's Elixer of Immortal Life: An Explanation of the Empowerment of 'The Long Life Practice of the Vidyādharas' (tshe sgrub dbang bshad - tshe sgrub bdud rtsi bum bcud kyi dbang bshad), by Jikme Lingpa. A Mirror Reflecting Clearly the Chöpön Activities for Rigdzin Düpa (nang bsgrubs rig ‘dzin ‘dus pa’i phyag len mthong gsal me long), by Patrul Rinpoche. English translation: A Clearly Reflecting Mirror, Chöpön Activities for the Rigdzin Düpa, the Inner Sadhana of the Longchen Nyingtik Cycle, in Jigme Lingpa, Patrul Rinpoche, Khenpo Chemchok, and Jamgon Kongtrul Lodro Taye, The Gathering of Vidyadharas: Text and Commentaries on the Rigdzin Düpa, Translated by Gyurme Avertin (Boulder: Snow Lion, 2017), page 169. The Words of the Vidyadhara which Bestow the Majesty of Great Bliss: A Guide to the Assembly of Awareness Holders (rig ‘dzin ‘dus pa’i zin bris rig ‘dzin zhal lung bde chen dpal ster), by Khenpo Chechok Döndrup Tsal (aka Khenpo Chöchok). English Translation: The Oral Agama on the Vidyādharas which Gloriously bestows Great Bliss, translated by John Newnham, 1990. English Translation: The Words of the Vidyādhara which Bestow the Majesty of Great Bliss, Rigpa Translations, 2007. The Light of the Sun and the Moon— Generation and Perfection Stages, Notes Explaning the Words of the Rigdzin Düpa, the Inner Sadhana of the Longchen Nyingtik Cycle (nang sgrub rig ‘dzin ‘dus pa’i ’bru ’grel), by Khangsar Tenpé Wangchuk (aka Tulku Tenpo). English translation: The Light of the Sun and the Moon— Generation and Perfection Stages, Notes Explaning the Words of the Rigdzin Düpa, the Inner Sadhana of the Longchen Nyingtik Cycle, in Jigme Lingpa, Patrul Rinpoche, Khenpo Chemchok, and Jamgon Kongtrul Lodro Taye, The Gathering of Vidyadharas: Text and Commentaries on the Rigdzin Düpa, Translated by Gyurme Avertin (Boulder: Snow Lion, 2017), page 95. Rigdzin Düpa Manual, based on oral teachings by Dzongsar Khyentse Rinpoche, Rigpa, 1999. Sogyal Rinpoche, Tenby retreat, UK, 18-22 April 1987. Khenpo Könchok Mönlam Rinpoche, San Francisco, 6-7 July 1998. Dzongsar Khyentse Rinpoche, Lerab Ling, France, 8-16 August 1998. Dzongsar Khyentse Rinpoche, Rigpa London, UK, 5-9 September 2001. Sogyal Rinpoche, Lerab Ling, France, 18-23 July 2005, during the Rigdzin Düpa Drupchö—based on Jikmé Lingpa's commentary, The Casket of Siddhis. Lama Chökyi Nyima, Clear Lake, USA, 3-5 December 2006. Sogyal Rinpoche, Lerab Ling, France, September 2007. Sogyal Rinpoche, Lerab Ling, France, 21 October 2009. Tulku Thondup, Hidden Teachings of Tibet (Boston: Wisdom, reprint edition 1997), 'Appendix 2: Description of Empowerment of Rig dzin Dü pa'. This page was last edited on 4 June 2018, at 03:22.